This page will continue to stay open and we will post any updates we receive. The American Saddlebred Horse Association (ASHA) is pleased to release the following announcement from the USDA's Animal and Plant Health Inspection Service regarding the recent battle over shoes, pads and bands. The USDA Task Force made up of leadership from the ASHA, the UPHA, AHHS and AMHA worked tirelessly on behalf of its members and would like to thank everyone who helped the cause by making comments to the USDA during the designated comment period. "This is a great day for our show horse breeds and while we celebrate this announcement I would like to caution everyone that this will be an ongoing situation that we must learn from and pay close attention to going forward," said ASHA President Bob Funkhouser. January 13, 2017--WASHINGTON-- The U.S. Department of Agriculture’s (USDA) Animal and Plant Health Inspection Service (APHIS) today announced a final rule that includes changes that will help to protect horses from the cruel and inhumane practice known as soring and eliminate the unfair competitive advantage that sore horses have over horses that are not sore. The practice of soring is intended to produce a high stepping gait through the use of action devices, caustic chemicals, and other practices that cause horses to suffer, or reasonably be expected to suffer physical pain, distress, inflammation, or lameness while walking or moving. The final rule addresses recommendations made by the USDA’s Office of Inspector General following an audit of APHIS’ horse protection program, which found the existing industry-led inspection program to be inadequate for ensuring compliance with the HPA. The rule also seeks to address the substantial noncompliance that continues to exist among Tennessee Walking Horses and racking horses and the relationship that continues to exist between the use of certain prohibited items and soring in horses, such as the use of permitted action devices alone or in conjunction with prohibited substances. Congress passed the HPA to end the cruel and inhumane practice of soring horses and stop unfair competition. Strengthening the HPA regulations and the enforcement of alleged violations is the best way to achieve this goal. 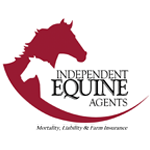 In addition, the prohibitions on the use of action devices and pads (with certain exceptions) are consistent with recommendations made by the American Veterinary Medical Association, the American Association of Equine Practitioners, and leading industry standards for equestrian sports. This final rule will be publish in the Federal Register in the coming days. A copy of the rule that was submitted to the Federal Register can be viewed here. The changes regarding the prohibitions on the use of action devices and associated lubricants for exhibitors of Tennessee Walking horses and racking horses, along with the training and licensing of inspectors will be effective 30 days after publication in the Federal Register. The rest of the rule will be effective January 1, 2018. The HPA is a law that was created primarily to end the practice of “soring” in some parts of the Tennessee Walking Horse, Racking Horse, and Spotted Saddle Horse Industries (all non-United States Equestrian Federation (USEF) regulated breeds). This law was passed by Congress and is enforced by the USDA. The USDA has the authority to create any Rules it deems necessary to enforce this law. These Proposed Rules were published on July 25, 2016 and a 60-day Public Hearing and Public Comment period began. This comment period ends October 26, 2016 at which time the USDA will review comments, make any revisions/changes, and finalize the Rule. Because the HPA is already a law, there is no Congressional vote. The ASHA remains dedicated to upholding the highest standard of equine welfare, and remains opposed to any and all practices that are designed to inflict pain or cause distress to horses, including the practice of “soring”. However, the proposed rule forbids the use of pads, bands and action devices in Tennessee Walking Horses, Racking Horses, Spotted Saddlehorses “AND RELATED BREEDS”. Elsewhere in the rule it mentions horses that “move with an accentuated gait.” We feel that the language used in this proposed rule is far too broad and would encompass many breeds including the American Saddlebred, Hackney, Morgan, Arabian and Half-Arabian, who have no history or soring nor any incentive to do so. All of these are “TROTTING BREEDS” and a horse cannot trot if it is not sound. 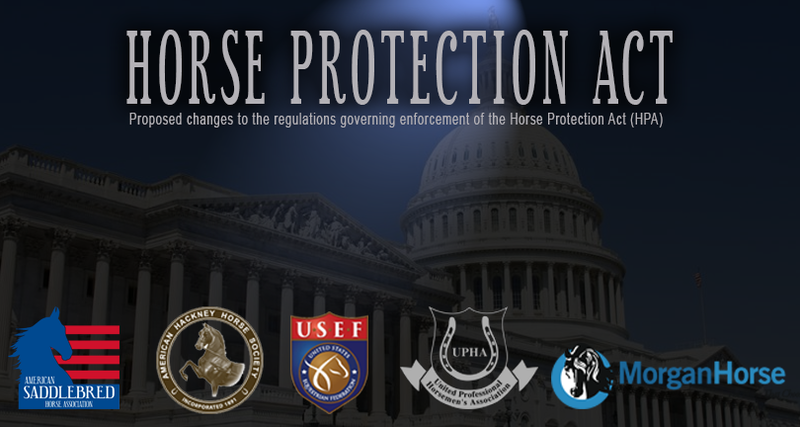 The ASHA, UPHA, AHHS and AMHA have been working with the USEF and the American Horse Council (AHC) to lobby the USDA to add clarifying language regarding their proposed rule changes to the HPA. Our main objective is to exclude trotting breeds (American Saddlebred, Hackney, Morgan, Arabian and Half-Arabian) from the regulation in order to eliminate any question about the application of these regulations to these breeds. Historically, these breeds have had no soring issues, are all USEF Affiliated breeds and are well regulated by USEF at recognized competitions. The American Horse Council (AHC) has submitted comments to the U.S. Department of Agriculture's (USDA) Animal and Plant Health Inspection Service (APHIS) regarding proposed changes to the regulations governing enforcement of the Horse Protection Act (HPA). The AHC supports taking action to strengthen HPA regulations, but in its comments requested USDA make several important improvements to proposed rule. The HPA was enacted in 1970 to prohibit the showing, exhibiting, transporting or sale at auction of a horse that has been sored. Soring is an abusive practice used by some horse trainers in the Tennessee Walking Horse, Spotted Saddle Horse, and Racking Horse industry. It usually involves the use of action devices, chemicals, stacks or other practices to cause pain in a horse's forelegs and produce an accentuated show gait for competition. Despite the existence of a federal ban on soring for over forty years, this cruel practice continues in some segments of the walking horse industry. Soring is not a problem in other segments of the horse industry. In its comments the AHC expressed its opposition to soring and its belief that action is needed to stop the soring of "big lick" Tennessee Walking Horses, Racking Horses and Spotted Saddle Horses. However, the AHC also voiced concerns that certain provisions of the proposed rule are too broadly written, not sufficiently defined, and could cause confusion for the horse show industry. The AHC's comments strongly urge USDA to explicitly limit all new provisions to Tennessee Walking Horses, Racking Horses, and Spotted Saddle Horses, mirroring the widely supported Prevent All Soring Tactics Act or PAST Act. The AHC believes making this change will address most concerns the horse industry has with the proposed rule and will still achieve the goal of ending soring. Additionally, the AHC supported USDA's decision to eliminate the current Designated Qualified Person (DQP) program and remove Horse Industry Organizations (HIOs) from having a role in enforcement of the HPA. The AHC believes the new Horse Protection Inspector (HPI) program proposed in the rule will be able to more effectively enforce the HPA. The AHC also asked USDA to take into consideration the costs the proposed rule could impose on smaller "flat shod" walking horse shows that make a good faith effort to comply with the HPA, and make accommodations for such shows. The AHC proposed several changes to the rule that it believes would help control costs for these types of walking horse shows.